Reliable engineered construction & tread options prevents equipment from getting stuck or creating ruts in soft soil conditions. Temporary roadways, parking areas or work platforms are easily assembled using proprietary Turn-A-Link fasteners. A rugged 0.5” recycled HDPE construction allows each heavy equipment mat to bend but never break, while supporting equipment up to 120 tons. Eliminate recurring plywood replacement costs and expensive turf repair. AlturnaMATS delivers real savings to your bottom line. Click on the tabs below to get detailed information on AlturnaMATS. AlturnaMATS® ground protection mats virtually eliminate the chance of equipment becoming stuck or causing rut damage. Constructed of 0.5″ thick engineered high density plastic, AlturnaMATS are an ideal solution to the expensive problem of repairing ground surfaces or repeatedly replacing expensive plywood sheets. These lawn protection mats easily support up to 120 tons and can be linked together to build temporary roadways, walkways, work platforms or parking areas. Plus, the lawn protection mats are available in black, white or NEW clear color options. Clear AlturnaMATS allow maximum UV penetration of the mat to support healthy turf growth and eliminate “burned” brown spots. 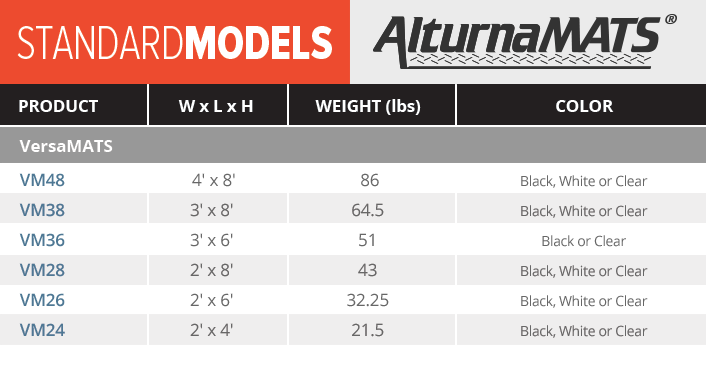 Black AlturnaMATS (4’x8’ and 3’x8’) are IN-STOCK NOW. Do You Need AlturnaMATS or VersaMATS? AlturnaMATS protect against vehicle traffic and feature a diamond plate tread design on both sides. These turf protection mats can be ordered standard (Std), smooth on one side (S1), or smooth on both sides (S2). VersaMATS feature a flat, slip-resistant tread design on one side and the AlturnaMATS diamond plate tread design on the opposite, allowing for combined pedestrian and equipment use. VersaMATS can also be ordered standard (Std), or smooth one side (S1). The one-sided traction option (S1) for AlturnaMATS and VersaMATS is ideal for crews wanting to prevent traction imprints or slide the mats easily on and off one another for storage. Handi-Hooks make it easy to move AlturnaMATS or VersaMATS. Constructed of solid steel and measuring 3.0′ long, Handi-Hooks provide a safe and efficient way to move your mats. Turn-A-Links provide secure connections that enable AlturnaMATS or VersaMATS to be linked together in order to create stable roadways or working platforms. Available in round or flat galvanized steel models. Do you use the following equipment? AlturnaMATS are likely the best fit for you to eliminate tire ruts and the chance of getting stuck. Other equipment requiring ground protection and/or traction. Do you use the following equipment or applications? VersaMATS are likely the best way for you to protect the ground surfaces you work on. We had a muddy mess of a project that was giving us fits. After getting stuck twice, we placed the mats down over 10” deep ruts along a muddy path and walked right over the mud hole and in to the staging area of the project. These mats work great! We could not be happier! – Bryan Vaughan, Vaughan’s Tree Service, Inc.
Standard delivery time is 4 weeks. During early spring and fall that lead times can be 4-6 weeks. They will be shipped as freight and require a forklift to unload. If a fork lift is not available a lift gate can be pre-ordered for a small additional fee. Yes, all mats can be ordered standard, smooth on one side or even smooth on both sides. Yes, but be advised the mats will be very slick in wet conditions and will have limited traction if used over elevation changes. Yes, VersaMATS are designed with a flat, slip resistant tread design on one side that is ideal for walking. The opposite side comes standard with the AlturnaMATS diamond plate tread or it can be ordered smooth (no traction). No, hand holds can be added. Q. How easy are your mats to stack and remove from a stack? They are easiest to stack and remove if one side has the VersaMATS traction or if a side is smooth. Either option allows mats to easily slide over each other. Yes, if left for more than a few hours in hot sun. Clear mats provide exceptional protection against turf burn, followed by the white mats. Yes, white and clear. Clear mats are excellent at preventing turf burn. Q. Can I drop tree limbs on your mats? Q. How much do the mats weigh? Tired of upsetting customers and repairing ruts after the job? Eliminate those concerns with AlturnaMATS, the #1 ground protection mat in the world. Ever gotten hopelessly stuck? AlturnaMATS is ​a ​professional solution that ​provides reliable traction and keeps you out of the mud. Plywood is inexpensive the first time you buy it. But by the second and third time, you could have easily paid for AlturnaMATS​.